The symmetrical triangle bottom is a bearish continuation pattern. The pattern is formed by two trend lines which are symmetrical to the horizontal and convergent. The first one is a bearish slant that will give support and the other is a bullish slant that will make resistance. 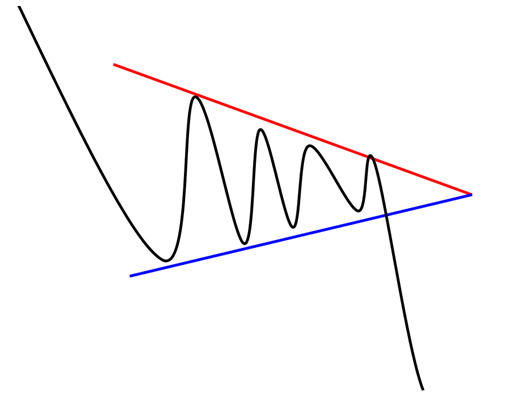 To confirm a symmetrical triangle bottom, there must have oscillation between the two lines. Each line must be touched at least twice for validation. To called a symmetrical triangle "bottom", it is necessary that the movement that preceded the formation of the triangle being bearish. The target price of this pattern is determined by its height from the base of the triangle that we carry over the breakpoints Another technique is to draw a parallel line to the resistance of the symmetrical triangle from the first contact point with the support to obtain a bearish target price.